This book is aimed to the shortwave listener, who is interested in digital signals. 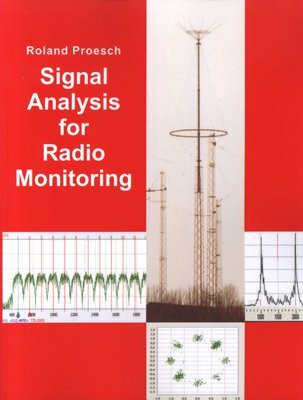 On 260 pages with 160 figures and 31 tables the reader is introduced to the world of signal analysis. 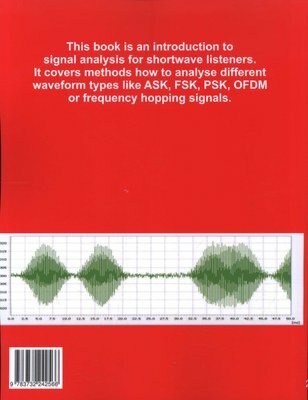 The book shall help a shortwave listener to identify digital radio signals. The different waveforms are explained and methodes are described how to analyse and retreave their main parameter. This includes for example the determination of the baud rate of an amplitude shift keying ASK, the measurement of the symbol rate of a phase shift keying PSK, the analysis of the parameter of one carrier of an orthogonal frequency-division multiplexing OFDM or the identification of the different values of a frequency hopping signal. The reader is shown that the same methodes used for determination of a continous frequency shift keying FSK can be used for a frequency hopping system with short bursts. Step by step the reader gets an introduction to the different methods for measurement of the main parameter of a waveform. Comprehensive tables like i.e. used alpabets, protocols, coding or designation of emissions are helping to identify the different waveforms on shortwave.